Nearly ten years ago we purchased our very first Christmas tree together as a married couple. I have to admit that I have always pined for a real Christmas tree with thick branches and the heady smell of evergreen filling my house, but there is one thing standing in the way of my dream. My husband’s allergies and his memories of many years spent running the Boyscout Christmas tree sale left him very jaded about putting a live tree inside the house. So, instead of having the sap and the needles of dead Christmas trees on our hands and our carpets, we have always owned faux fir instead. Since we couldn’t afford much when we first married, our old tree wasn’t the best quality. Now, I’m not going to lie. That old tree has seen a LOT of mileage. But it took a ton of work to get it photo-worthy. Every year when the tree came out of the attic I typically spent hours fluffing and coaxing it to look as real as possible. Then I spent even more time trying to figure out where to plug in all the lights and wires and getting frustrated because entire section of the tree lights would stop working, so I would have to pile a whole bunch of excess lights on it to make it look decent. But after ten years of fluffing and re-lighting and re-stuffing the old tree in and out of the attic, it was beginning to look more like a Charlie Brown Christmas tree than a freshly chopped forest masterpiece. 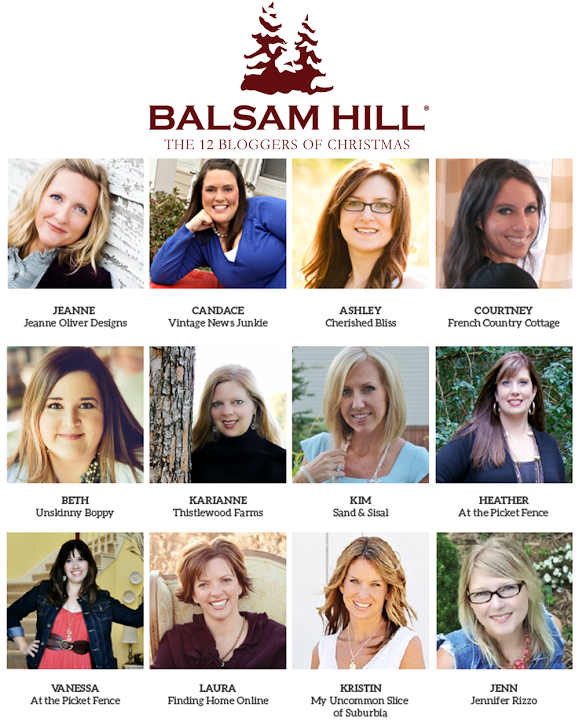 This year I decided that I wanted something new, so when the awesome ladies from At the Picket Fence asked if I would be interested in joining up with Balsam Hill for their 12 Bloggers of Christmas tour, I jumped at the opportunity! Let me introduce you to the newest member of our holiday home… this beautiful new 6.5’ prelit Shasta Fir tree from Balsam Hill. Ain’t she a BEAUT, Clark? Balsam Hill partnered with several bloggers to showcase their collection of Christmas Trees this year, and I’m THRILLED to be a part of this parade of trees! Oh, how I love this thing! 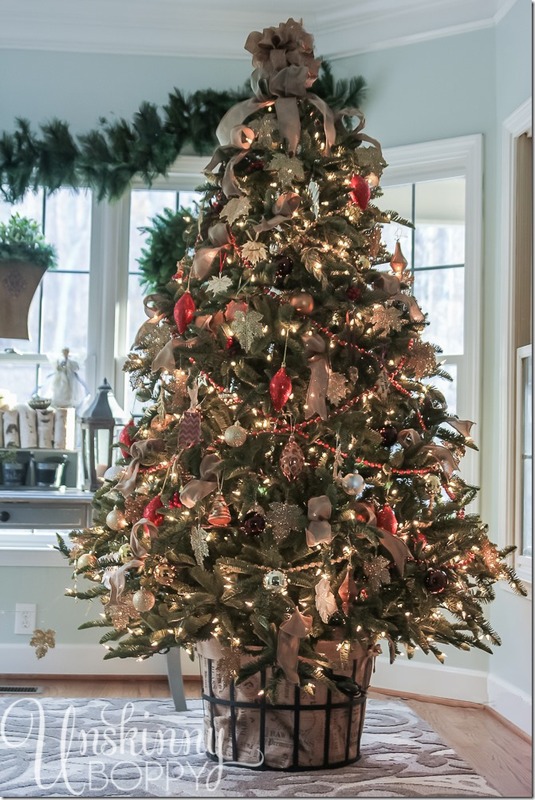 This Balsam Hill tree is so much better than my old cheap tree. Just let me count the ways… For one, the fluffing was extremely minimal! I spent about a quarter of the time fluffing this tree than I did my previous one, and it looks completely gorgeous. Secondly, the prelit lights all work properly AND they are lit by an in-trunk lighting system! Yes, you read that right. There was no guesswork on which cord plugs into which doo-hickey, no scratching your eyeballs while digging through the tree hunting for cords to hook together…. None of that. We just slipped the three pieces of the tree trunk together and BOOM. Instant lights. This was the easiest plug setup I have EVER met on a Christmas tree. It was seriously amazing. Then there is the foliage. It looks totally REAL, y’all! And not only does it look real–it feels real, too! The needles are soft and bendy and not scratchy like my old trees fake greenery was. This Balsam Hill tree looks like it is fresh out of the Vermont countryside where I chopped it down all by myself and lugged it home on my bobsled yelling “Gee! and “Haw!” to my mule team. Except I didn’t do any of that stuff. We didn’t even have to break a sweat, because this was the easiest tree we’ve ever assembled. I even got fancy and put it inside a burlap basket this year. This adds to the realness, I think. Don’t you? You’d never know there were concrete blocks hiding inside there to lift the bottom branches up above the basket rim. When the tree arrived I was worried that my old ornaments might not look too great, so I tried to use only my cream of the crop ornaments on this tree. I chose to keep it all burgundy and gold with bronze and burlap accents. I’m totally loving this color choice. Besides, my little chevron Alabama ornament fits in great! 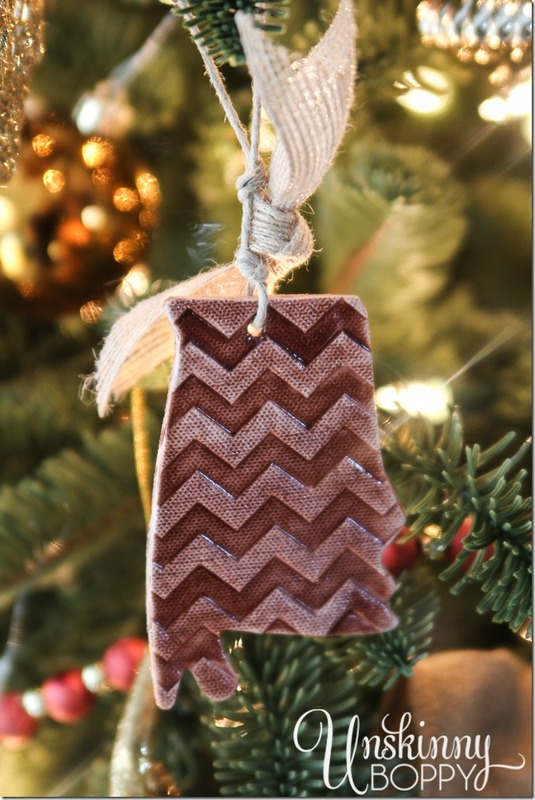 If you’d like one of these Alabama ornaments for your tree, you can order them from Gifted Handmade Boutique! It was also the perfect opportunity to showcase all of my gold leaf ornaments that I’ve collected from various mountainous vacations over the years. I have gotten quite a collection of gold leaf ornaments now! 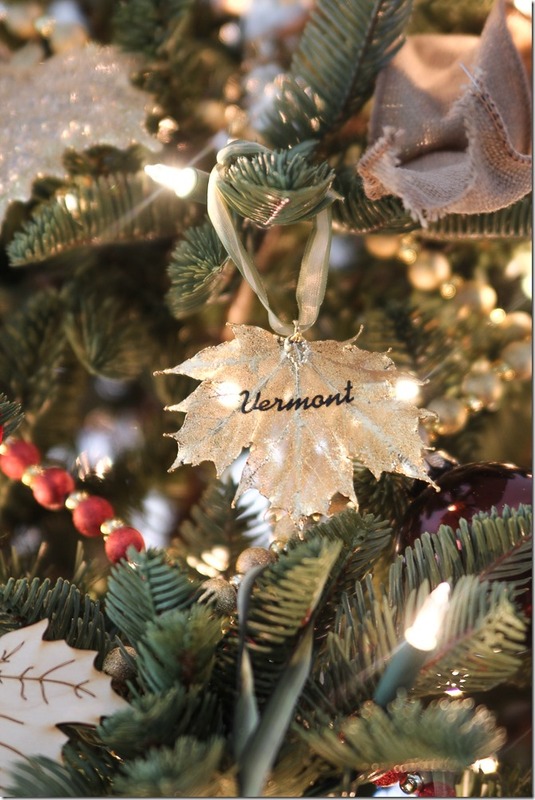 I’m thankful for lots of fun vacations over the years to help fill my tree with Christmas ornament memories like these…. I could not be any happier with this beautiful new tree. It’s seriously like my dream Christmas tree, because it looks and feels real, but it doesn’t cause my husband to have sneezing fits and freezing boyscout tree lot flashbacks! Winner, winner, chicken dinner. 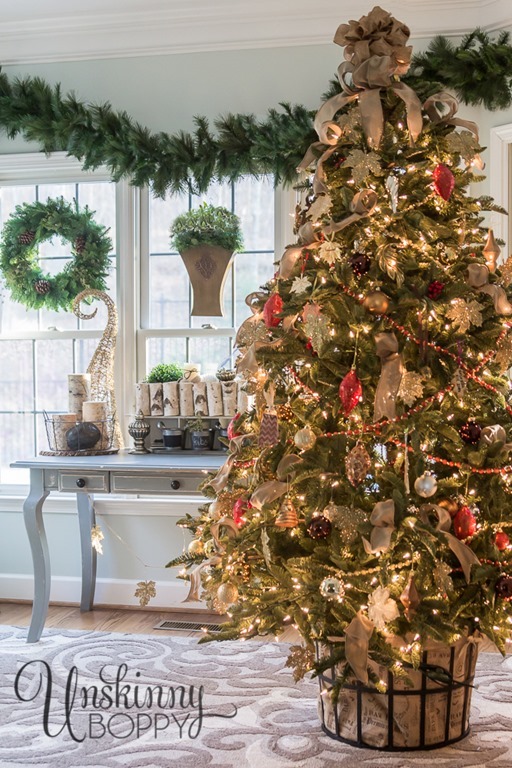 Balsam Hill also makes it super easy to find exactly the tree you need with their categories page. Shop by Level of Realism, Height, Light type, Shape and Collection to find your perfect tree. And guess what?? Balsam Hill wants to give away a whole BUNCH of gift cards to their website so that you can have the chance to buy one of these lovelies for yourself!! Here is the giveaway which is live from 12/8 through 12/11/13 so go enter fast if you’re visiting this week! 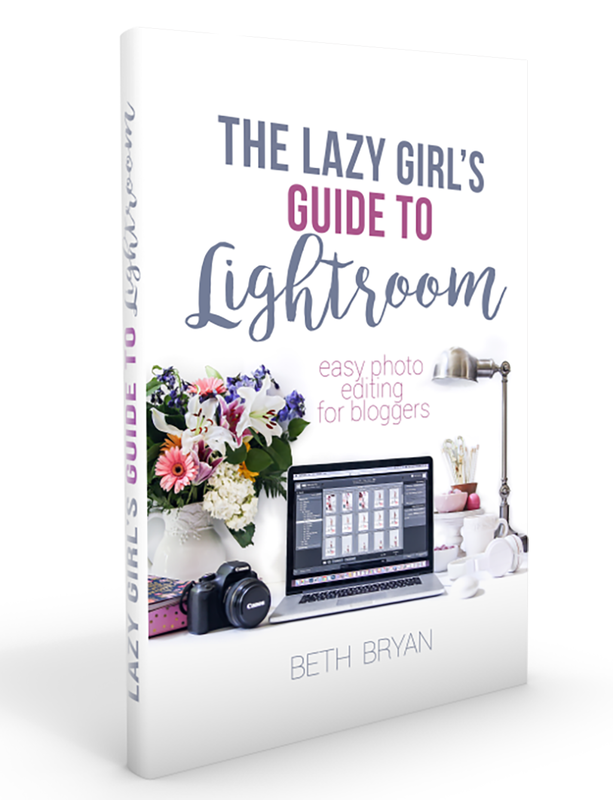 Disclaimer: Balsam Hill provided me with a free Christmas tree in exchange for this blog post and promotion of their giveaway. As usual, though, all opinions about tree sap and mule teams are my own. PS: It’s Day 2 of the Annual Holiday Housewalk featuring some amazing home tours of talented bloggers. Click here to visit Stop #1, Jenn Rizzo’s house, to begin the tour! Your tree is very nice, and I love your color theme! My artificial is very much like yours, now 10 years old, and I also went to the Balsam Hill website, anticipating needing a new one last year, and again this year (I am rationing lighting to make it last!). I select a slim profile, no more than 44″ at the base, but still get questions every year as to whether it’s real or not. I love the 6.5′ one, and the way you’ve put it in the burlap/wire basket. If anyone deserved this tree, it was you, my friend!! What a beautiful story of your family and the real need for a beautiful tree that will last a lifetime!! And I just know this Balsam Hill tree will do just that!! I am honored to be your pard’ner for the day!! And that wire basket tree skirt is so my style!! I just LOVE it to pieces!! That is pretty real looking, lovely and all that stuff..(faux fir ah ha ha ha ha!). So who is going to stand in front of the new one for the photo op this year? Maybe it’s time for Mr. Boppy to go viral! The basket you’ve used for the tree stand is perfect! The whole tree looks amazing! BETH!! This is so beyond fabulous…I’ll be waiting for my Alabama ornaments in the mail…hehe! The basket you have it in, to die for and it seriously looks so real I think I could smell the sent of pine through the monitor. Thank you so much for participating in this with us! Love ya my friend. Oh my gosh!!! Your tree is gorgeous!! I truly want one right now!! And your decorations are beyond beautiful!! 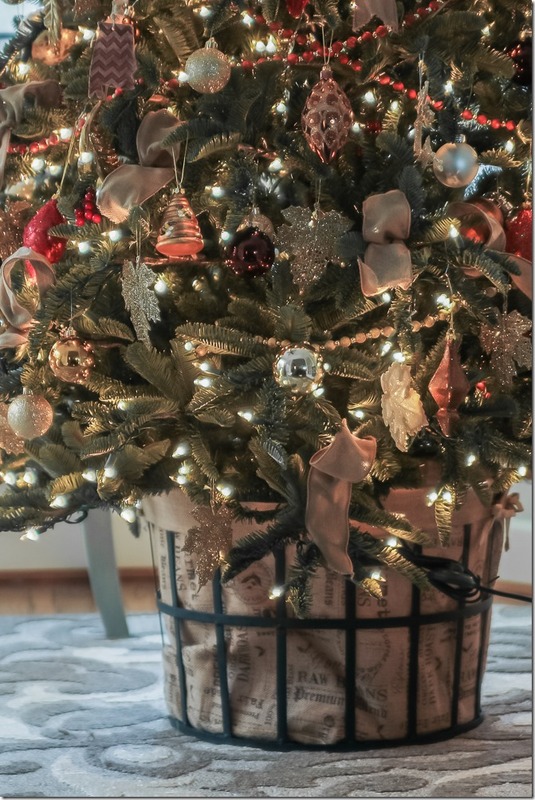 I had already decided to put our tree in a bushel apple basket this year and decorate with burlap, mercury and a touch of red – I can’t wait to get it up and decorated!! We had a flood in our basement this past spring and I lost the tree (2 years old and gorgeous!!) and alot of my Christmas ornaments from years in the past. Not only my ornaments but my son’s that I have saved for ever!!!! I think I will bop over and take a look at those trees – they may be in my future!! WOWZA your tree is stunning! What a beautiful story, so well deserved! I stacked concrete pavers on top of each other, then put the stand and everything right on top so the bottom branches were high enough to touch the top of the basket. And, the basket came from TJMaxx! I need a new tree!! Mine was in the same shape as yours and it got tossed back in August. I just went to the website and am crossing my fingers for one of those giveaways on Sunday!!! The trees are GORGEOUS!!!! I love your tree! Oh my, how it looks so real, especially in that basket! Beautiful! Ok so seriously. I have seen 4 million Christmas trees this week , a few in my own house and this one is one of my FAVES! Rockstar your tree is smokin – HOT like a little rockstar marching in the band! hehe. Pinning right now. I put my tree in a large red plastic bucket this year but the stand was to large so I had to rig up something and now the tree is leaning. 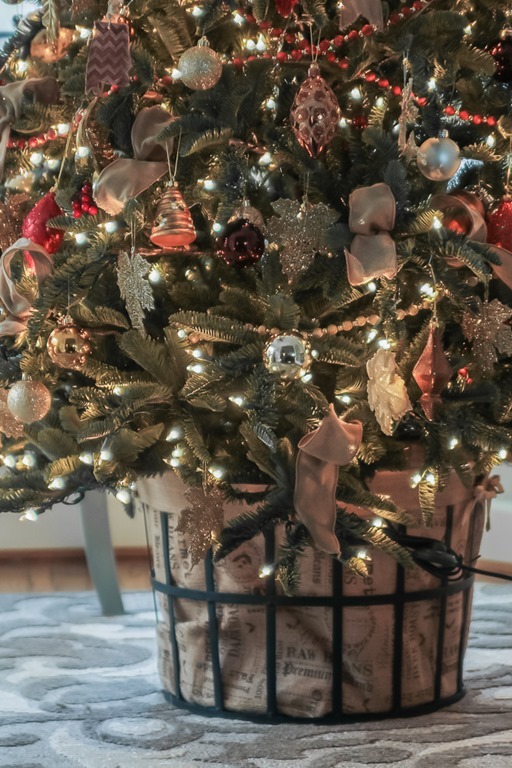 How did you get your tree in the bucket and is it secure and safe? Oh it’s just beautiful!- love how you added personal touches from your travels and is great the base- is that printed burlap? Your Christmas tree looks gorgeous! 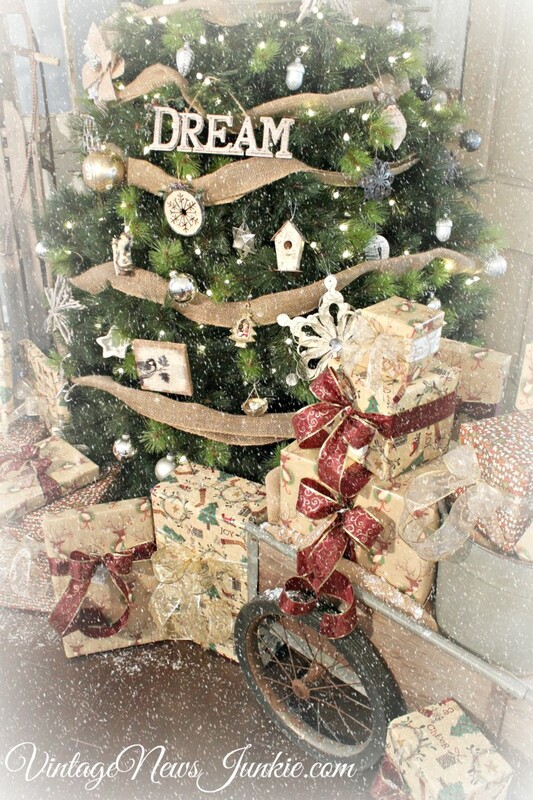 I especially love the burlap basket and the ribbon tree topper. OMG the trees from Balsam Hill are so gorgeous they really, really look real, I love them, and yes I did enter to try to win one of the life-like trees . And I love how all you girls decorated them in your own way. I love when not real trees look so real, and their so full . Thanks for sharing them with us. GORGEOUS !!!!!! Your tree is just beautiful! Love the burlap basket. Where did you get it from? I’ve been looking for something substantial to pop my tree in. I love your tree from Balsam Hill. I am considering buying one for next year. Would you please tell me the girth of your tree? When I look on their site..the girth is enormous! Your tree looks as though it would work for me but when I looked at their site..once again..the girth measurement is very large. I must not be measuring correctly. Your help would be greatly appreciated!